How to clean your bathroom efficiently? *Update: I have since switched to using Oxygen Bleach. *Update 2: An alternative to Mothers PowerBall, if you don’t have a power drill. 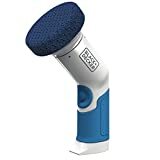 I recommend BLACK+DECKER PKS160 Power Scrubber. I have been amazed at how well this thing works for cleaning sinks, tubs, showers and even dishes. This thing scrubs away the tough built on dirt. The brush on this scrubber is made out of really thick rough material, and I believe this is the reason that it cleans so well. *Tips: I recommend Energizer Ultimate Lithium batteries (it takes 4 AA), because they won’t ever leak and ruin your scrubber, they are way more powerful than the original batteries, they last for what seems like forever, and for ones in storage, they have a 25-30 year storage life. I find it works quite well when applying medium pressure to the scrubber. It’s powerful enough that when applying pressure it does not stall, it simply scrubs harder, which is what I want in a device like this. This scrubber is designed perfectly and it’s made out of very strong high-quality material. I am sure that it’s going to last for a while because the plastic is very thick and it’s not made out of flimsy material. The handle on the scrubber has a nice curve in it and this makes this scrubber very easy to use & grip. This scrubber is battery powered. Not as powerful compare to Mothers PowerBall attached to the power drill. 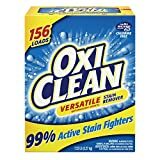 Oxygen Bleach is better than chlorine bleach, safer for your health, environment, does not corrode the fibres of fabrics and clothes like Chlorine. It can be mixed with other cleaning products. For general disinfecting, add some to your bucket of hot water and mop floors with it. As a disinfecting countertop spray for your kitchen & living room. Simply mix it with warm water, or get liquid Oxygen Bleach. Look at the ingredients, it should contain sodium percarbonate. A bathroom is a part of our home that sometimes seems most difficult to clean. Stubborn stains, dirt, grease, soap scums, rust… You name it! So many irritating things we have to clean, deal with and, yet, it can be so hard to reach or remove them sometimes. On the other hand, it is essential to clean it and not just on the surface – bathroom is a home of many different kinds of bacteria that can seriously endanger our health. It is very important to keep it clean all the time and take one day in a week to clean it even deeper. Still, sometimes we don’t feel like cleaning or we just don’t have time – so we want to do it as easiest and fastest as possible. Although you may have your own ways of cleaning, we believe that there is always some extra room for more useful information and advice which can provide you easier, faster and more efficient cleaning! Bathtub may be the toughest part because it is the biggest, so we are going to start and mainly focus on that one. Still, we are going to give you some helpful tips about the sink, toilet and the rest of the bathroom as well. Since we use it to clean ourselves, it is not a surprise that some of that dirt remains on a surface of our tub. Sometimes it is hard to clean it properly because there are so many places and corners that are difficult to reach. Luckily, we have some tips for you that you can also apply on a sink too. Let’s get to the point then! Sometimes most obvious choices may not be the right one. That is why we would like to introduce you a new way of cleaning your bathroom and a new product named Mothers PowerBall. What’s most unusual is that you are not going to find it within any category related to cleaning or something similar. 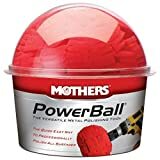 Mothers PowerBall can usually be found on automotive section (in your nearest supermarket or Amazon) at a very reasonable price. Still, a great thing about it is that its usage does not have to be related to the cars only. It is a foam tool designed for polishing and revitalizing larger or smaller surfaces, stainless steel, billet, aluminium or even more. The best thing about it is that it fits very tight spaces as well. Foam PowerBall is super soft which is definitely why it makes it so much easier to reach areas that are usually pretty hard to clean. Because of that, this helpful product is not going to damage or scratch any surface up. Yet, it will leave them fresh, clean and polished. After you get your own Mothers PowerBall, first you have to plug it in or screw it into your power drill. So, your cleaning tool is ready – what’s next? First of all, make sure to empty your tub and remove all the soap, shampoos and accessories that you usually use and that can stand in your way while cleaning. Then fill your bucket with one or two gallons of water. You can use any shower, tile or tub cleaner you want. If you are using a new one, make sure to test it on your tub first in order not to get a product that can discolor something or leave weird stains on the surface you want to clean. No matter what solution you choose, just read directions carefully and use it wisely – when it comes to cleaning your bathroom, chemicals can be strong and you have to hand them properly. Gloves are something that you must have in order to protect your skin. It would also be good for you to use respirator so you can avoid inhaling chemicals and damaging matter. Dip the PowerBall in your bucket! In order to avoid spilling water everywhere, just spin it above the surface of your bucket. The cleaning process can start. PowerBall is an excellent tool for cleaning tiles around your tub, soap dish and grouts. You know how irritating sometimes it can be to clean corners of your bathtub because it is so hard to reach them? Well, no more difficulties there, since PowerBall can clean those too! You can use it on every part of your tub: overflow pipe cover, the spouts, handles and even the drain. It is a big foam ball, which makes it easy to clean even bigger surfaces very fast. This thing can be very useful with cleaning sink as well. Besides that, you can even clean tiles and spaces between them on your floor or walls. After you finish your PowerBall cleaning process, you can use your detachable shower head and spray down all the surfaces. If you do not have any, you can just take a regular sponge, soak it with water and remove what is left on each and every surface you have cleaned. Something you need to remember is that this is just a fast, easy and efficient way of cleaning your bathtub – but it is not meant to be deep cleaning. It is really important to keep our toilet clean. Still, no matter how hard we try, it can easily happen that we notice stains after some time. The best way of cleaning it is to use a toilet brush and some good, strong cleanser. A toilet is a place with even more bacteria than the rest of the bathroom so cleaning soaps can even contain some stronger and harsher chemicals in order to destroy those. We have to say it again – protect yourself. Gloves, respirator… (If it is very disgusting) Whatever actually keeps you safe. Here is a useful tip for cleaning those parts that toilet brush can’t reach – use an old toothbrush. That is a great tool to clean all those hidden areas in our bathroom that usually may be out of our reach. It doesn’t have to be for the toilet only – there are plenty of corners in our home where a toothbrush can be very helpful in a cleaning process. Apply any of adequate cleansers and let the party begin. It would definitely be a better option to use more natural products while cleaning your home. We are aware of the fact that it can be hard sometimes since there are so many suitable products on market, but you can at least take a break from all those toxic and harsh chemicals from time to time. That way you can provide yourself a healthier kind of cleaning. The best thing about natural cleansers is that you probably already have them in your kitchen. If not – they are cheap, healthy, ecologically acceptable and easy to get. Above all, they truly provide amazing results! Vinegar – Not only that this well-known liquid is great for your food preparation, but also for cleaning your home! You can just dilute it with some water and apply it to your cleaning tool, whether it is a sponge, rag or even Mothers PowerBall. You can sometimes use vinegar & water combination instead of those cleaners you can find in your supermarket or on Amazon. It is a great thing because it helps you get rid of grease, soap scum and that stubborn dirt we can usually find in our home. Baking soda – Baking soda is sodium bicarbonate, or in scientific terms, NaHCO3. If you haven’t used it for cleaning yet, wait no more! It is an excellent product that can be used in many ways, but it is also well-known as a great and helpful cleaner. Combining baking soda with just water can already provide amazing results while cleaning your bathroom. Still, in order to clean your bathroom even better, you can combine it with vinegar as well! Citric acid – it can be found in lemons, oranges and the rest of citrus fruits. It disinfects and deeply cleans stains, dirt or grease you would like to remove. The best thing about is that it leaves a really nice smell. Salt – we use it during our food preparation, but salt can also be used for cleaning. You can just take your cleaning tool, put some vinegar and salt and polish the surface you want to clean. Whatever cleaning products you use, make sure you rinse them and wipe water after you are finished so you wouldn’t get some new stains because of it. We hope this was helpful and wish you a clean, healthy and beautiful home like you deserve it!